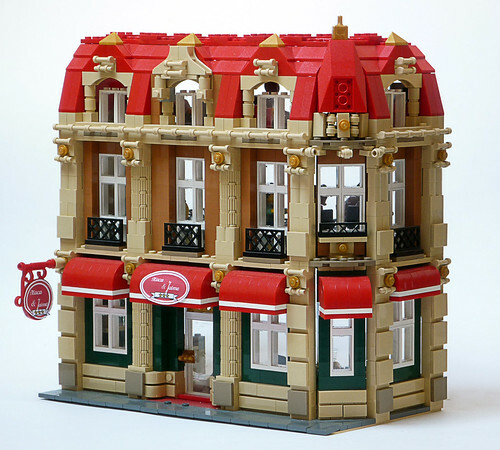 Brick Town Talk: Table for Two - LEGO Town, Architecture, Building Tips, Inspiration Ideas, and more! Restaurant Row - (BTT) Valentine's Day is fast approaching - have you made dinner reservations yet? Allow me to suggest Maca & James, surely one of the classiest places in town, assuming they aren't already booked up. The beautifully detailed exterior, with its bold use of green and red, certainly draws the eye - step inside and expect to find the well-groomed waitstaff always willing to open a bottle of wine to help you celebrate any occasion. Certainly a night to remember!